The answers to both questions can get complex, so we’re going to try to explain what is going on in a series of short articles. We talked about the trade-offs between using a white light with a filter compared with a dedicated blue light in an earlier video. That was mostly based on quantitative measurements and visual demonstration, but it didn’t directly address the questions above. In this article we’ll talk about what lumens are and how they relate to some of this conversation. This will not go into great scientific detail, and there are plenty of resources on the web if you want more information. Please feel free to contact us if you have specific questions. There are two basic approaches to measuring light intensity – radiometric and photometric. Radiometric measurements are absolute measurements of intensity of electromagnetic radiation. Watts are a radiometric unit. Photometric measurements convey how bright a light will appear to a human observer. Photometric measurements take into account the sensitivity of the human eye to different wavelengths (colors) of light. Lumens are a photometric unit. So what’s the difference? We humans can see a spectrum of electromagnetic radiation ranging from about 380 to 700 nanometers (units of wavelength, abbreviated as nm). That corresponds to the colors ranging from violet to blue to cyan to green to yellow to orange to red. Not all of those wavelengths produce equal sensations of brightness. As an extreme example, if we go to wavelengths just shorter than 380 nm we have ultraviolet light. This is also called ‘black light’ exactly because we can’t see it. (There are a variety of critters that can, but that’s a different story.) You could have a really intense UV light that makes things fluoresce brightly, but its lumen output would be zero. It just doesn’t make any sense at all to ask about the lumen output of a UV light. The same is true at the other end of the spectrum, the region below red (the infrared). The sensitivity of the human eye under normal lighting conditions is greatest at 555 nm, solidly in the green. That is, for lights with equal radiometric (watts) output, a light at this wavelength would appear brightest. One watt of light (radiometric) at 555 nm would give a brightness reading of 683 lumens (photometric). So what about the blue light that we use for exciting fluorescence? 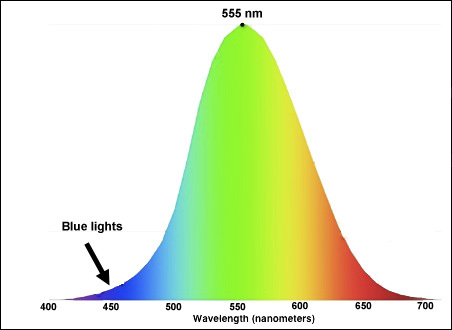 Whether you add a filter to a white light or use a dedicated blue light, you will end up with light output primarily in the 450 – 460 nm range, solidly in the blue. In this range one watt produces only about 34 lumens. That’s right – only about 5% of the lumens of green light! It’s still 1 watt (radiometric), but only 34 lumens (photometric). See the figure below. Our eyes are just not very sensitive in this range. Another way of thinking about this is that those blue lights are a lot brighter (radiometrically speaking) than they look. If you started rating blue lights in lumens it would be pretty depressing compared to what we are used to for specs of white lights. So where do lumen ratings come from in the first place? Manufactures measure the total light output of their lights. The right way to do this is to use a device called an integrating sphere that captures the light coming out in all directions. The light is then channeled to a calibrated detector that takes into account the mixture of wavelengths in the light (since not all wavelengths are equally good at producing brightness) and produces a reading in lumens. What does this have to do with how well a light will work for fluorescence? With fluorescence our first question should not be ‘How bright is this light?’ but ‘How bright a fluorescence does this light produce in the things it shines on?’ We will discuss this more in Part 2.